So how about this weeks CRAZY weather, we've gone from cold and rainy to warm and sunny, welcome to winter in California. Don't blink or you'll miss it. At least it cleared up in time for the big roadster show, THANK GOODNESS!!!! Hope you can make it out to the Grand Daddy "Drive-In" at the Pomona Fairplex this weekend, it's a huge show with the most amazing cars, if you've never been before this show needs to be on your bucket list for next year. For all the details you can go to www.rodshows.com. Also, if you're looking for a show that's a little smaller but still fun for the whole family then be sure to head out to the Norco Bob's Big Boy on Sunday Jan 29th from 2pm-5pm, and grab a famous burger while you're there. Last week I asked you all to give me you're picks for the Super Bowl, and I'd like to thank Jerry Maxwell for playing; he chose Patriots vs 49ers, I was picking Ravens vs Giants. Of course I would have liked to see my New Orleans Saints, but, Oh well....next year. I would like to take a moment and ask for your feedback. I have been sending the newsletters out on Wednesday and I'd like to know if you are enjoying them mid-week or would you prefer to start recieving them on Friday evening? Please let me know, I will be happy to make that adjustment. Let's take a look at what we've got coming up in February. On Saturday Feb 11th is the 10th Annual Palm Springs Cruisin' Association Dr. George Car Show in Indian Wells. The show is open to all Street Rods, Classics, Special Interest Cars, Trucks & Motorcycles. Show starts at 9am and includes food, vendors and entertainment. Proceeds go to benefit the Desert Cancer Foundation. Also, the monthly show at Norco Bob's Big Boy will be on Sunday Feb 19th from 2pm-5pm. Make sure you are following us on Facebook, join our Fan Page by searching THE SPEED SHOP to keep up on customer rides pics, show videos, up to date show info and the latest happenings with us. You can also be "Friends" with me by search TAMIE RED and send a friend request. 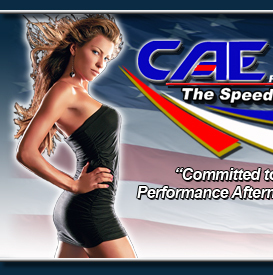 And you can also check our website at www.caeperformance.com and check our EVENTS page for a list of upcoming shows, races and cruises. If you have a show or event coming up and would like me to include it in my weekly newsletter, just email me at caeperformance@aol.com with all your info and I'll be sure to get it out there for you.